There are a number of companies claiming to want to focus on initiatives to empower women in leadership positions, as well as close the gender wage gap. 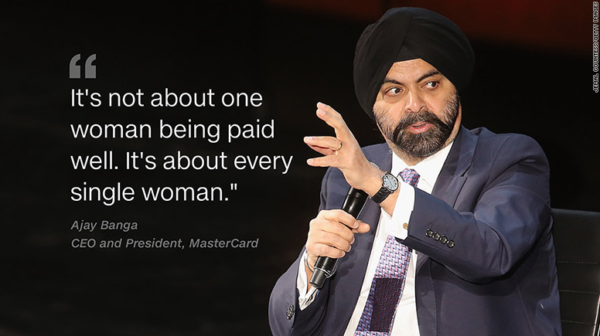 If they’re looking for a successful blueprint to follow, it should be Mastercard, headed up by CEO and President Ajay Banga who proudly boasts in interviews and discussion forums how every woman at the company gets paid the same amount as her male counterpart. His comments about women at Mastercard made headlines after he spoke at the 2016 Women In The World Summit in New York City, where he was interviewed on stage by the event founder Tina Brown. 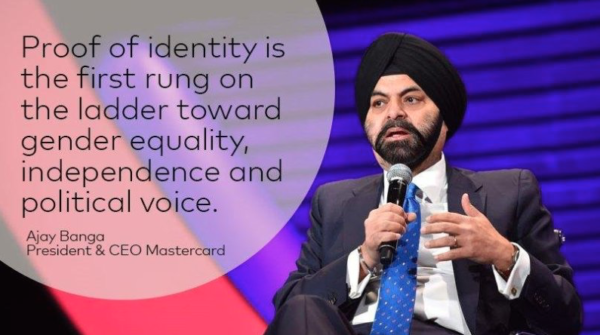 He used the example of Mastercard’s CFO who is a woman, and emphasized that wage equality cannot just be seen in prominent leadership positions, but all throughout the company. “The point is not one person. The point is every single woman. And if somebody gets in my way on that, they will be working in one of my competitors very quickly,” he said. He went on to mention how other aspects of Mastercard enable a more gender equal culture, proving how it is possible for major corporations to adjust their employee structure so that everyone thrives, not just men. Mastercard offers 16 weeks of paid maternity leave, and 8 weeks of paid parental leave. They do this to ensure more women stay in the workforce and are encourage and supported to do so by family-friendly company policies. “Having people to help with childcare is only one part of respecting women. Both genders have to take ownership,” said Ajay. Additionally, the financial company is doing its part to close the gender gap in the STEM world, another area that is still lagging behind in terms of representation of women. “I hate the idea that women don’t work in tech. It’s bulls***. At MasterCard, 60% of the women work in tech,” he said. 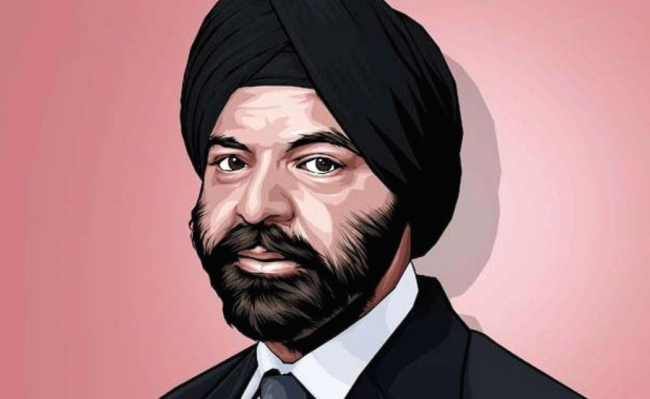 Aside from his duties as CEO and president at Mastercard, Ajay spends time outside work putting his money where his mouth is by getting involved in initiatives and organizations that encourage and empower women financially, across the world. He is on the board of Ellevest, an organization that aims to close the gender gap in investing. Ajay has also partnered with World Bank to help women in under-developed areas gain access to basic financial tools in order to help them gain independence and freedom to pursue greater opportunities in life. 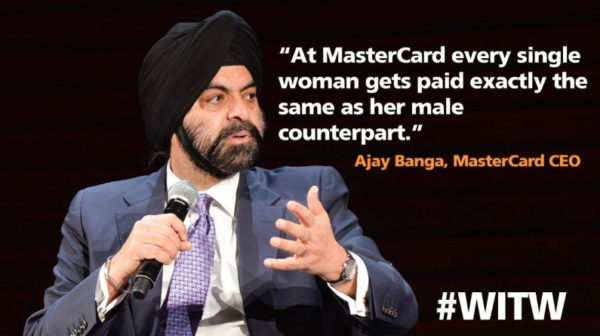 In an interview for the Ellevest website with co-founder and CEO Sally Krawcheck, Ajay spoke further about closing the wage gap at Mastercard and his work with the World Bank. His perspective on why focusing on bringing greater equality for women sounds like the biggest no-brainer, but sadly we still have a long way to go until it is commonplace. “If half the world’s population is female and purchasing decisions are made 70% of the time by females, you should be caring deeply about having people around you who understand how women think, operate, use things, approach issues…It’s a really smart thing to surround yourself with people who are different from you. Since I am a man, it kind of strikes me: It’s a really good idea to have women around me,” he said. He does admit that to get more women in top level executive positions is much harder than lower-level roles, and a lot of that is down to women taking time out of their career trajectory to have families and finding it tough to get back into that stride after. Which is why Ajay believes paid family leave is an important part of changing the status quo. “There are many other things you can do, which we’re doing, which is to allow them to, in fact, encourage them to bring their kids to work while they’re off from work for a few months. So, the connectivity with their colleagues and their pals remains, and they’re not away for six months and suffer a lack of confidence when they come back…All of that changes the mid-career issue…this mid-career thing of providing the right opportunity to come back is the best way to get [women] up the ladder,” he said. When questioned about details on how Mastercard eliminated their gender wage gap, Ajay explained how examining company data in terms of how many women vs men in certain levels there were, seeing how many men vs women got promoted, and then engaging directly with managers throughout the company got the ball rolling. “Once we actually sorted through to start looking at people who got promoted or joined or entered a level at the same time, what did they get paid, and then segregate that from what happened if their performance scores were different…I began to find very few real anomalies in the company,” he said. When managers starting hearing that the CEO was making calls, the issue quickly became of importance throughout the company, which again shows how those at the very top level of leadership really do have the power to set the culture of a workplace. We’ve also seen a similar thing happen with another male CEO – Marc Benioff of Salesforce who, upon learning that women were being paid less than men for doing the same job, decided to make major changes and ensure the inequality was corrected. 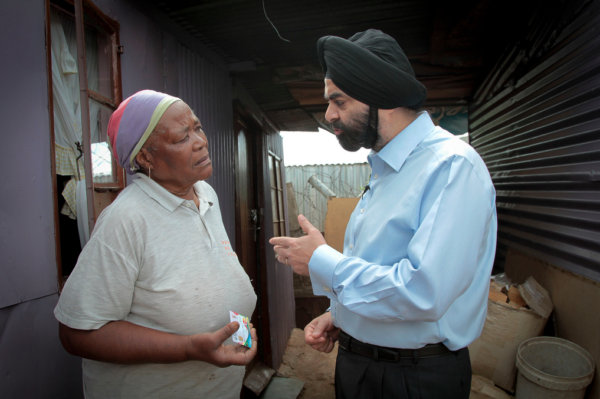 As for his work with the World Bank to empower women financially, it was another “no-brainer” for Ajay who believes more businesses should get on board with initiatives like his. “Remember, 50% of the population is women. If you’re in the business of making and selling things to people, well, you’re only selling to half if you aren’t ensuring that the other half have access and capability and spending power and all those things,” he said. After learning there were 2 billion people in the world without any sort of financial “identity” and learning how important it was when women gained this, Ajay recognized the greater impact of women being able to open their own bank accounts and have a credit card in their name, for example. “If you don’t have an identity, by the way, nobody cares about you. No one comes to you when governments conduct questionnaires to figure out what they aren’t doing well in something…an identity is a pathway to decency and being seen and being noticed,” he said. He learned about this issue while in South Africa with Mastercard, trying to find ways to enable women to access money from a social security program without being exploited or taken advantage of in any way. The program figured out from working with local NGOs that putting money on a card which is attached to their biometrics, instead of handling cash, it became the most effective method. Ajay met an elderly woman who showed excitedly showed him her card, which became an interaction that has stuck with him ever since. “I keep this with me. This is my dignity,” she told him. “Once she explained everything to me, her identity, the fact that the person she was staying with could not beat her to get access to the money, I suddenly realized that there’s more to life than just inclusion — there’s just basic dignity,” he said. At the end of the interview he mentioned a very important point about the need to empower women financially, saying it has wide-reaching effects throughout her community. “I learned long ago, that if you make a woman economically independent and, more importantly, therefore socially independent, she actually uses her independence in a very different way from the average man in many places. The first thing she does is put the money back into her kids. It’ll normally be a better school, a light to study at night, drinking water by a tap instead of being fetched in a bucket. It’s stuff that makes the kid have a better life. And very quickly it becomes about the family. So, if you get the woman to be socially independent, that family improves,” he said. We highly recommend reading the full interview with Ajay over on the Ellevest website, and to get familiar with more of Ajay’s work and learn why he is so enthusiastic about the financial empowerment of women, you can watch both his WITW Summit videos below, from 2016 and 2017.